You’d like to manage your own software outsourcing, but need to reduce your risks and gain maximum results. With Accelerance Coach, you’ll receive professional guidance through every phase of the software outsourcing lifecycle. Choose the entire program or the precise components you need for success. You’d like a professional to manage your outsourcing so you can keep your focus on other initiatives...With AcceleranceComplete, you get the software you want while we manage all the global development details. Complete is our most comprehensive consulting package that gives you professional, experienced management across the entire outsourcing lifecycle. Don’t see a package that fits? Talk to us about your situation. No matter what your software outsourcing needs are, we're here to help. The success or failure of your software outsourcing is predictable and manageable. Professional guidance for every step of the software outsourcing lifecycle. Each component of Accelerance Coach helps your company gain proficiency in the software outsourcing lifecycle. Choose the entire program or the precise components you need for success. How will your company mitigate risks for software development? What steps are necessary to maximize strengths, minimize weaknesses and improve software outsourcing results? Plan is a 2-3 business day planning session with Accelerance advisors. We’ll dive deep into your internal strengths and weaknesses in software outsourcing. You’ll walk away with a tailored plan of action to address your major risk factors. Is your software ready to outsource? Are all aspects of the specifications clearly defined and detailed enough to get an accurate cost estimate from an outsourcing provider? Discovery is a 2-3 week process to gather and review project requirements and specifications you’ll need to share with prospective outsourcing providers, determine appropriate technologies for executing your vision, and develop high-level plans. How do you find a global development partner that’s perfect for your requirements? companies around the world. We travel to deeply assess top software companies across more than 200 criteria. When you work with a proven Accelerance Partner, you work with a team you can trust to deliver. How will you effectively work and collaborate to ensure proper software development and alignment with one another? Align is a 2-3 day facilitated workshop that brings you and you chosen partner together to learn what it takes to work seamlessly. Accelerance works with both companies to establish expectations, roles, development approach, communication and other best practices. How do you begin your software outsourcing engagement and simultaneously implement internal changes needed to mitigate your outsourcing risks? Embark is an 90 day partnership that builds momentum and accountability for the execution of your plan. Accelerance works with your team to execute your software outsourcing plan, start right and achieve early wins. You’ll receive 90 days of weekly coaching calls to assess the current state of the your outsourcing engagement - specifically with respect to implementation of findings from Plan and Align and focusing on actionable items and high value processes. The race is on. You’re out of the gates and heading in the right direction. How do you stay on target during an ongoing engagement? Advance is an additional 90 day coaching package designed to continue the Embark process and help you maintain momentum and accountability throughout the life of your engagement. You’ll receive 90 days of weekly coaching calls to guide on-going management of your outsourced engagement, weekly identification of potential challenges before they have significant effects on the engagement. Keep your team focused on actionable items and continue high value processes. How will you identify issues before they become problems to achieve optimal outsourcing results? FREE for every Accelerance client, Optimize is the most unique consulting service available to create success in software outsourcing partnerships. Each quarter your Accelerance account manager will review the status of your outsourced engagement(s) with both you and your software development partner(s) to improve the overall performance of both parties. Based on survey feedback and conversations with each party, you’ll receive an assessment of the overall health of your software outsourcing. Optimize helps your company recognize high-performance areas as well as potential risks to avoid. You’d like a professional to manage your outsourcing so you can keep your focus on other initiatives. With Accelerance Complete, you get the software you want while we manage all the global development details. Complete is our most comprehensive consulting package that gives you professional, experienced management across the entire outsourcing lifecycle. Better planning. Better partner selection. Better management. Accelerance brings more than a decade of global software outsourcing experience to your software outsourcing success. Our proven methodology introduces best practices that reduce your risk of a costly, low-performance experience and build high-performance software outsourcing. Far too often, a company will begin outsourcing with eagerness, but within just a few weeks or months, development has gone sideways, the vendor relationship deteriorates, and the benefits expected from outsourcing go unrealized. It’s easy to blame the vendor, but often, the root cause of struggle is a lack of internal readiness for software outsourcing. We can help. The success or failure of your software outsourcing is predictable and manageable. Accelerance guides you and your team through a hands-on process that examines 15 risk areas across three dimensions of business readiness that derail software outsourcing success. Then, we’ll work together on a plan to overcome internal obstacles and risks. 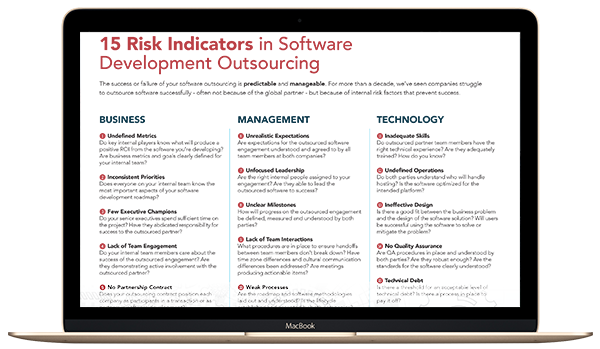 We’ve worked with with hundreds of clients on global development projects, and we’ve identified potential risk indicators across 3 important dimensions of software leadership: business, management and technology. Most tech leaders aren’t experts or even experienced when it comes to choosing the right global software team. On your own, you’re faced with thousands of confusing options, risky unknowns, and tepid qualifications. Due diligence in partner selection is critical. You don’t want to work with companies that operate with no hiring or training standards, no oversight or support, no guaranteed retention or continuity, no insurance or security and no easy way to scale or organize. How can you be sure you’re working with a great partner … and quickly? Accelerance searches the world so you don’t have to. We’ve reviewed more than 8,000 global software companies to create the most trusted network of high-quality global software teams ever assembled. Our research team reviews top global software companies across more than 200 criteria in key areas of business and technical maturity. Here’s a sample of the business areas we investigate on site with our top partners around the world. The Accelerance research team has reviewed more than 8,000 companies around the world so you can outsource with confidence. Want to know which ones to trust? The first weeks of software outsourcing set the tone for the entire engagement. Your plan could hit the rocks in as little as 3 months if important sign posts are overlooked or mismanaged in the excitement and urgency of launching development with your new global team. You need experience to know what to watch for. Accelerance guides both you and your global partner so that your first 13 weeks are smooth and development begins quickly with early wins. You’ll avoid mistakes and oversights that create risk down the road. Great decisions and habits formed from the onset will put you on track for high-performance outsourcing months down the road. Tool selection for issue reporting, sprint planning, source code control, etc.